2013 has come to an end and we find ourselves at the beginning of an exciting new year! The common cliché is the “New Year’s Resolution,” where people decide to make a significant change in their lives. Unfortunately, for most people, making big changes in your lifestyle can be very difficult to start and even harder to keep. Whenever I recommend changes in a patient’s habits, I always recommend small, gradual changes that are made with consistency. These are far more effective than drastic changes implemented for a month or two. We’ve all known someone who engages in a fad diet, only to put the weight right back on a few weeks after they’ve finished. So what changes can you make to your dental health, which are simple, and easy to maintain? The most effective anti-cavity treatment, believe it or not, is controlling your diet. Cutting sweet and acidic drinks like pop and juice will go a very long way towards preventing cavities. Everyone knows pop is bad for you, from the standpoint of calories as well as sugar and acidity. But often, people substitute other drinks, which they think are better for them. The most common is natural fruit juices. I will concede that natural sugar is better than artificial sugar, but in the end it’s still sugar, and that means it is food for bacteria. Not to mention most fruit juices are very acidic, as well. The acid in both pop and juice weakens your enamel and the sugar feeds the bacteria already in your mouth to start multiplying and producing more acid! The end result is a hole in your tooth, commonly known as a cavity. Simply drinking more water throughout the day and saving pop and juice for special occasions, or as an uncommon treat, will not only help your teeth, it can take inches off your waistline. 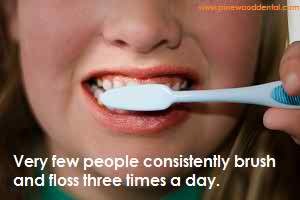 After a good cleaning patients will often get motivated and tell me, “Doc, I’m gonna start brushing and flossing three times a day!” To which I typically smile and reply, “I doubt it.” Very few people consistently brush and floss three times a day. We all have very busy lives, we have a lot on our plates and adding a tedious oral hygiene ritual is not going to help if we can’t stick to it. This is why we customize our hygiene recommendations for patients. If you’re already flossing once a day before bed, fantastic! You’re ahead of the curve, now slowly start adding in a second flossing in the morning. If you don’t floss at all, start slow. Floss a couple times a week. Once you’re consistent with that, move up to three times a week, then four, then five. Pretty soon you’ll be flossing everyday, and it w become a part of your regular regimen. With all the recommendations we make, I always remind people, get organized and keep to a schedule. Set up your six month checkups in advance. When someone is leaving our office after a cleaning we always to try to get the next cleaning set. The most common response is, “I’ll check my schedule and give you a call, I don’t know what day I’ll be free in six months!” But this is the wrong attitude. When you leave the office you have other commitments that take up your time and energy. Suddenly that dental visit you were motivated to make has fallen off your radar. By scheduling in advance you are making your dental appointment a priority. You wouldn’t skip changing the oil on your car, because you know that without regular maintenance, your car will no longer be reliable. Your body and teeth are no different. They require regular scheduled “maintenance” to avoid costly “repairs” later! FINALLY, don’t forget, it’s a new insurance year. You have fresh benefits to use so don’t let another year pass by without maximizing your insurance. Make 2014 the year you finally make yourself a priority.